What is truth? This has become the defining question of our time. 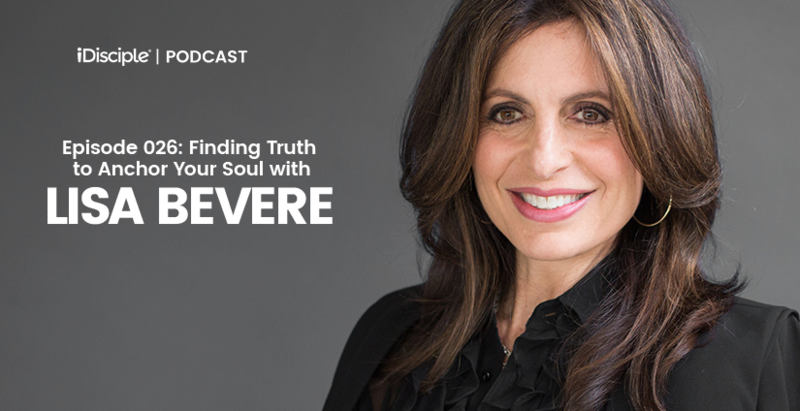 Today’s special guest on the iDisciple Podcast, author and speaker Lisa Bevere, wants all of us to know that truth isn’t just something, it’s someone. Lisa has spent nearly three decades empowering women of all ages to find their identity and purpose. She is a New York Times bestselling author and internationally known speaker. Several of her books, including Fight Like a Girl, Lioness Arising, Girls with Swords, and Without Rival, are in the hands of millions worldwide. Lisa and John, are the founders of Messenger International, an organization committed to developing uncompromising followers of Christ who transform their world. Messenger International has given away over 7 million resources in 106 languages. Today, Lisa is joining us to talk about her latest highly anticipated book, Adamant: Finding Truth in a Universe of Opinions, and helping explain how we can discover truth that can anchor our souls in a culture full of opinions. We hope and pray that this conversation helps you build your life on the unchanging foundation of Jesus Christ, and helps you lead others to the same truth! Lisa shares her testimony of how she, as a young adult, fell into the traps of partying and running in the opposite direction of God’s truth until she met her husband John. Why Lisa originally doubted her decision to become a Christian because of how the enemy attacks us according to our destiny. The importance of creating resources and writing books for women, and why Lisa believes it is so important to empower women who have not been treated well by the church. Lisa tells the story of how she came up with the name of the book, Adamant, and what it means for the truth of Jesus to be the unmovable and unchanging. Why we, as Christians, have done such a bad job of preaching the truth with love, and how we can start blending the two in a way that Jesus wants us to. Lisa explains why she wrote this book for Christians to deal with the “shadow places of their own heart” as opposed to exposing sin in the world. If you enjoy this episode, please head over to Apple Podcasts, Google Play, or Stitcher Radio and subscribe to the iDisciple Podcast! While you’re there, please leave us a rating and a review. We love to hear feedback from all of our subscribers! If you would like even more resources on finding biblical truth, download the iDisciple app! Since 2013, iDisciple has been leading people into a closer relationship with God through music, sermons, and devotionals, all in the palm of your hand! Check out www.idisciple.org to learn more, and sign-up for iDisciple today. Today’s episode is made possible by In Touch Ministries, one of our valuable ministry partners. In Touch is offering our listeners a free devotional delivered directly to your mailbox. Sign up for your free devotional here.